Santo Thirteen Amenta (Sonny), 67, entered into rest on Monday, November 19, 2018 at home. Born in Hartford, son of the late Anthony and Lucy (Siena) Amenta, he lived in West Suffield for forty years. Santo was a certified welder for Butler Welding and Goodway Transport. He was a member of the Southwick Senior Center and in the Future Farmers of America through Suffield High School. Santo was also an avid fisherman, hunter and woodworker. He leaves his wife of 45 years, Patricia M. (Bendel) Amenta West Suffield postmaster, two sons and their wives, Sonny Joseph and Patricia L. Amenta of Suffield, Benny Patrick and Jennifer M. Amenta of West Suffield, a brother, Salvatore Amenta of Enfield, five grandchildren, Autumn, Angel, Aurora, Xavier, Lucia and a great-grandson, Giovanni. The calling hours are Friday at the Heritage Funeral Home, 1240 Mountain Road from 4-6:30pm with a service at 6:30pm. The burial will be private. In lieu of flowers, donations may be made to the Amenta Family, c/o 369 Griffin Road, West Suffield, CT 06093 to help with funeral expenses. 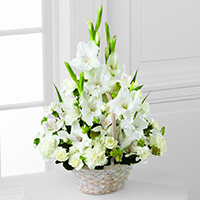 To send flowers to the family of Santo Thirteen "Sonny" Amenta, please visit our Heartfelt Sympathies Store. Additional Information	The calling hours are Friday at the Heritage Funeral Home, 1240 Mountain Road from 4-6:30pm with a service at 6:30pm. The burial will be private. In lieu of flowers, donations may be made to the Amenta Family, c/o 369 Griffin Road, West Suffield, CT 06093 to help with funeral expenses. We encourage you to share any memorable photos or stories about Santo. All tributes placed on and purchased through this memorial website will remain on in perpetuity for future generations.